During March of this year, the Government Satellite Report team had the opportunity to attend the Washington D.C. satellite show. 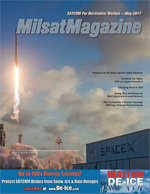 Saving Time and Resources: Mesh Space and Ground Networks, by David K. Chan, Ph.D., Vice President, Sales & Marketing, Quintech Electronics, Inc.
SATCOM Frontier Perspectives: New Partnership Means Greater Coverage and Offering A Helping Hand To Canada, This new partnership will enable Intelsat General to offer Skynet services to their already strong existing customer base. In early April of this year, Intelsat General entered a strategic alliance with Airbus Defence and Space that will give their customers access to the X- and UHF frequency bands using the Skynet satellite constellation, increasing the firm's capabilities and services in the APAC region.